DETROIT (AP) -- Chrysler's U.S. sales rose 1 percent in September on strong performances from the Jeep Grand Cherokee and Ram pickup truck. The gain may be an outlier as major automakers announce sales Tuesday. Analysts predict that overall industry sales fell about 4 percent in September because the Labor Day weekend was counted with August sales. That pulled some sales from September into August. Chrysler said it sold 143,000 cars and trucks last month to post its 42nd-straight month of sales gains. The company's dealerships eked out the slight increase even though there were two fewer selling days than September of 2012. "They still outperformed the industry and extended our sales streak," said Reid Bigland, the company's head of U.S. sales. Sales of the Grand Cherokee SUV rose 19 percent for the month, while the Ram pickup posted an 8 percent sales increase. Chrysler joined many industry analysts in predicting that U.S. auto sales would fall in September, snapping a 27-month streak of year-over-year gains. Analysts say a quirk in the calendar — not lower demand — is to blame. Labor Day weekend is typically strong for U.S. auto sales, and this year was no exception. But because the holiday came early, the auto industry counted all of that weekend's sales in its August tallies. That means September's sales will be missing the usual holiday boost. 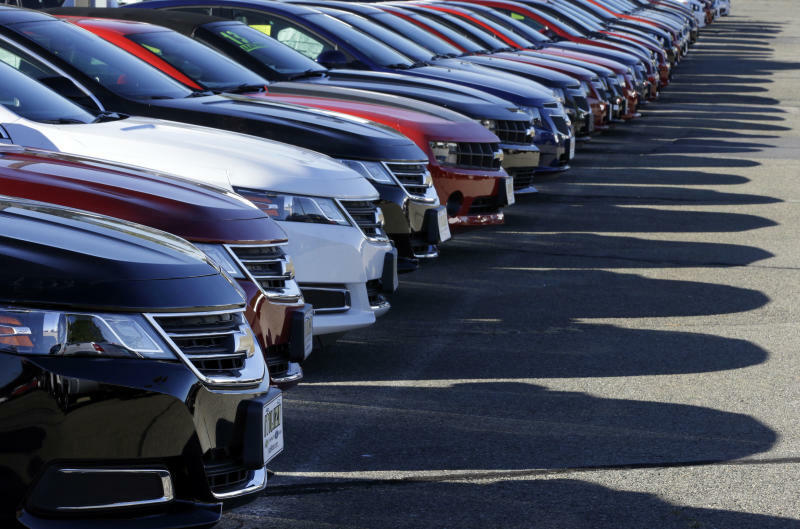 But analysts say all the factors that have been driving this year's strong car sales — including low interest rates, the improving economy and the need to replace aging vehicles — remain in place. They see a strong close to the year. "The market continues to move at a very healthy pace," said Erich Merkle, Ford's top U.S. sales analyst. September U.S. sales are expected to total around 1.1 million, according to auto shopping site Edmunds.com. That would be a 4 percent decrease from last September and a 24 percent decrease from the blistering pace in August, which was the best month in more than six years. Toyota is expected to post a small gain on the back of the new Corolla small car, which went on sale last month. Full-size pickup truck sales, which have been strong all year, also likely rose in September, benefiting Detroit automakers, Kelley Blue Book said. But midsize car sales may have declined, since sales of new midsize cars like the Volkswagen Passat and Honda Accord were particularly strong last September. The U.S. government shutdown could be the wild card that affects future sales, although Jim Lentz, Toyota's North American CEO, said in an interview that he doesn't expect consumers to stop buying unless there is a credit crisis.